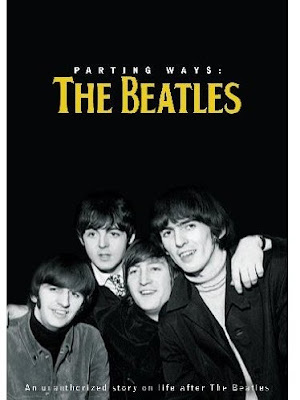 In this brief fifty-one minute unauthorized documentary best suited for television broadcast rather than purchase or even rental, filmmakers chronicle the lives of the Fab Four following the breakup or rather more fittingly dubbed “divorce” of The Beatles. Although for the most part it fails to shed much new light on its subject, Parting Ways nonetheless makes for passable entertainment that's sure to appeal to die-hard fans. A rather one-dimensional overview of post-Beatlemania existence for the men that's told in the order of their involvement with the band, the DVD from Infinity Entertainment Group presents their mini biographies from “the first Beatle” aka John Lennon all the way up through the last (Ringo Starr). Admittedly it does come as a bit of a surprise that the disc delves into the usually ignored eighteen month separation of John Lennon and Yoko Ono that he spent with Yoko's assistant May Pang, with whom Yoko suggested that John take up in the early '70s. However, one of the eerier focuses of the disc considers the effect of Lennon's death by assassination on the remaining Beatles. While the DVD reveals that Paul McCartney became especially weary of touring, Parting Ways delivers a startling blow by illustrating the impact it had on George Harrison who is painted as something of a near hermit for not leaving his estate much, only to find in a cruel twist of fate that he became the target of a home invasion by a mad stabber, whom he fortunately was able to outmaneuver. Thankfully the disc doesn't spend the majority of its running time fixated on the macabre as it celebrates the individual musical achievements the four had following their split and the way that in some cases they ended up collaborating on other material. Retaining its small screen style look of a full frame aspect ratio and 2.0 sound, although the disc offers four bonus featurettes that center on everything from Stella McCartney's role in fashion to the men's spiritual exploration, overall it seems to blend right into the background of way too many superior Beatles retrospectives.